That's the wild ride that is sweeping the Pacific Northwest! We are currently experiencing something extraordinary in Victoria on our flats and I was fortunate enough to witness it over the past couple of days. Yesterday (April 24), I finished up some local field work and when I got home I checked if there were any sightings of interest. My jaw dropped when I saw a pair of Black-necked Stilts (Himantopus mexicanus) were found by Mary Robichaud at Panama Flats. I called up Jeremy Kimm and asked if he would be willing swing by and get me because Janean was at work. He didn't put up much of a fight and half-an-hour or so later I was at Panama Flats. It was almost anticlimactic because a chase usually entails a bit of a search. When we got out to the edge of the southwest corner of Panama Flats, Ann Nightingale and Marilyn Lambert were casually watching the pair of stilts. I raised my binoculars and there they were. That's always the desired result, but I still like to work for a bird a little! Black-necked Stilts had only been recorded in Victoria three times prior to this event, and the window they turn up in is quite narrow. 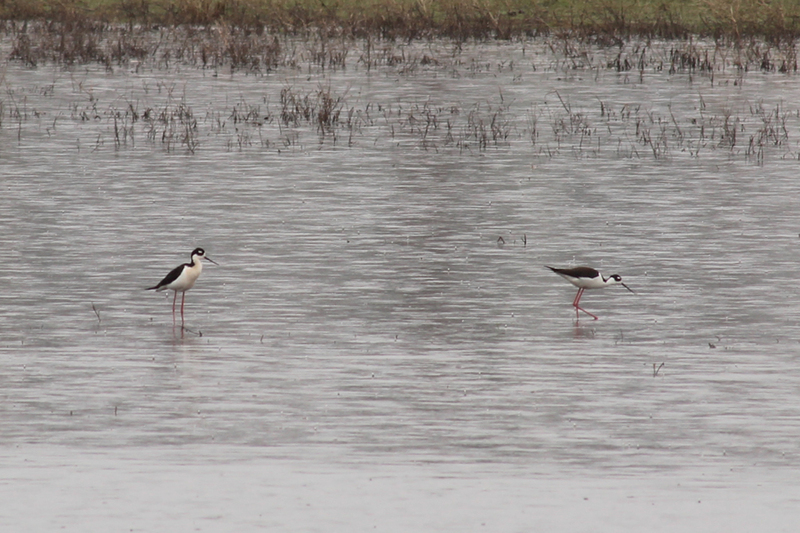 It seems the last week of April is prime stilt time here. I had never seen a Black-necked Stilt in Victoria so I really wanted see them and put myself one notch closer to my goal of 300 species in the local checklist area. Once my eyes locked on to the stilts, I inched closer by moving up to 286 species. You would think it ends there, but there's more. I talked to my dad when I got home today (April 25) and we decided to go for a quick outing before dinner. We ended up at Maber Flats because I was thoroughly impressed with the way the southern field looked for shorebirds when I visited last weekend. When we got to the marsh edge, I scanned out and saw what appeared to be stilts. I put them in the scope and indeed they were! We were very excited and I speculated that the pair we were looking at might be the same set from Panama Flats because one had a pinkish wash to the chest and the other lacked it. But what was at the back of the flats - two more tall, black-and-white shorebirds? I looked at one pair of stilts and immediately panned back to the other just to see if I missed the first pair quickly relocating. Nope. Four Black-necked Stilts in one area! With a whole slew of southern interior birds turning up in the Pacific Northwest, I wonder what else is waiting to be turned up? So far we've had: Lewis' Woodpecker, a handful of Yellow-headed Blackbirds, a Western Kingbird, three Long-billed Curlews, and, in Vancouver, a male Calliope Hummingbird. Hopefully the stellar cast continues over the next couple weeks!